Our clients work with very challenging issues where there is no clear way forward. Many diverse people are involved and everyone has a different idea of both the problem and the likely solution. It’s complex and uncertainty is high. Clients know that collaboration is the key to getting solutions that stick but they also know that working together can be hard. You know complexity. Lots of interconnecting issues and different opinions about the problem. High levels of uncertainty about not just what to solve, but how to go about solving it and who with. The risk of unintended consequences is high and the best way forward is very unclear. At every turn you find yourself thinking “I don’t know what to do next”. It is complex, and it is going to need a different approach. If you could just tell everyone what to do and they’d do it, life would be simpler. But in the real world, we are rarely in that position. More often you need everyone thinking together to find the smartest, most effective solutions to the complex problem. Everyone sees things from different angles. You need a solution that works for all and if you aren’t all working together to implement the solution you won’t fix anything. You need to collaborate, and that isn’t always easy to do. Wanting to collaborate is important, but having the ability to work collaboratively with others on complex issues is the key to success. Collaboration requires a new set of skills. It requires new behaviours that have you working differently. But most importantly, collaboration is about a mindset that sees the world differently and invites others into conversations you’ve never had before. If you need to tackle complex issues by working better together, then you need the capability to think and act like a collaborator. You need collaborative intelligence (CQ). The Power of Co™ underpins our approach to collaboration. 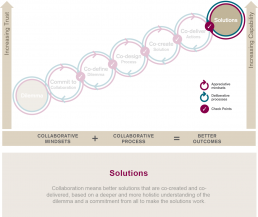 It provides a simple, clear and powerful ‘map’ of your collaborative journey from facing a complex dilemma to co-delivering lasting solutions together. that are better than they thought possible, with ownership and implementation by all. You can access the Power of Co™ with Collaboration Builder, incorporating our collaboration training and collaboration coaching. The complex situation you face, the wicked problem that is hard to define and resistant to solution. This is the thing that brings collaborators together. The acknowledgement that this dilemma can only be resolved by working with others. This is where you make the choice to start the collaborative journey. Everyone sees the dilemma differently. This step is where you work together to understand and agree the problem to be solved, from all perspectives. Only then can you begin to find potential solutions. Before trying to solve the problem, collaboration involves designing together the process you will use to find the solution. This step is about everyone’s fingerprints on the way you work together, rather than what you work on. This step is focussed on finding solutions to your shared dilemma that are better than any single person could create alone. Working together means everyone’s fingerprints are on the outcome. The power of collaboration is that it builds ownership of solutions and momentum for implementation. Everyone has energy to make solutions happen. Collaboration means better solutions that are co-created and co-delivered, based on a deeper and more holistic understanding of the dilemma and a commitment from all to make the solutions work.